Difficulty: Orange - each day is a challenge in its own right, with a tough climb to take on, as well as plenty more ups and downs to test you. It’s more than worth it though for the views at the top. Our biggest weekend of riding, with three truly stunning rides to take on; pick one, test yourself with two or join our 200 club by challenging yourself with all three. Friday and Saturday both start from the town of Llanidloes, whilst Sunday begins not far away in Welshpool. Enjoy the peace and quiet as the ride starts on Sustrans cycle routes, following the rivers Severn and Wye just a stone’s throw from their hill-top sources. A tough climb alongside several small rocky waterfalls is well worth it as you arrive at the very top of the Elan Valley, a moon-scape with a series of reservoirs separated by impressive Gothic-style dams that you descend alongside on a Tour de France Alpine-like descent through wooded hills until you reach the lunch stop at the visitor centre. The afternoon finds you following a series of quiet roads through the Welsh hillsides, passing villages little changed in centuries with architecture ranging from Victorian manors through to iron-age earthwork forts. The day begins with a series of challenging climbs, up past another beautiful reservoir surrounded by forested hills. A short respite as the terrain eases briefly is followed by a climb up what must surely be one of the most incredible roads in the UK. 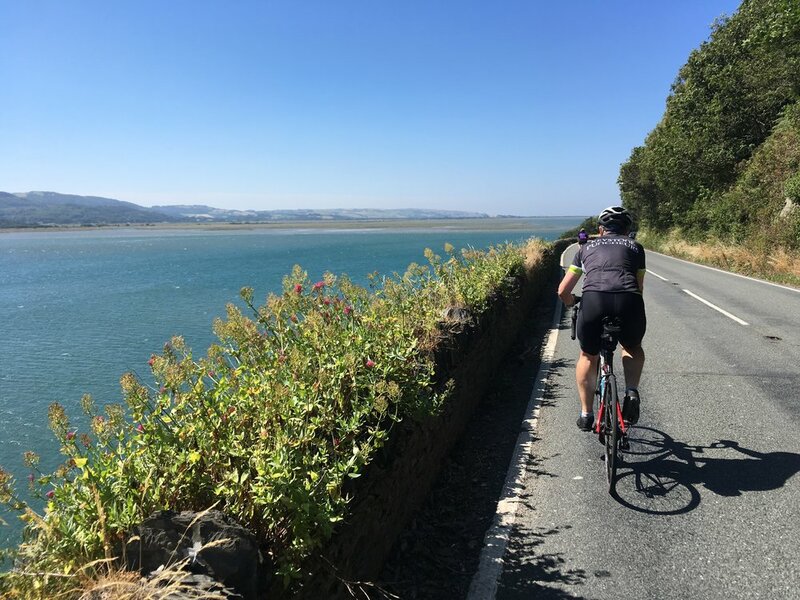 Part of the Cambrian Mountains, you’ll ascend the short side of a beautiful mountain, starting with an ice-age gorge on your right and ending on the highest road route in Wales on the Sustrans network. On the horizon you’ll see the peaks of Snowdonia, higher and more dramatic still, before an 8-mile descent (you heard me right) into the market town of Machynlleth for your first feed stop. The road then hugs the beautiful Dyfi estuary until we reach the sea at the little fishing village of Aberdovey. We follow the coast north before heading in-land at Tywyn alongside the historic Talyllyn steam railway on your right and the towering mountains of Snowdonia on your left. Pass Talyllyn Lake and then lunch at the foot of the famous Cadair Idris in an old stone tea room. 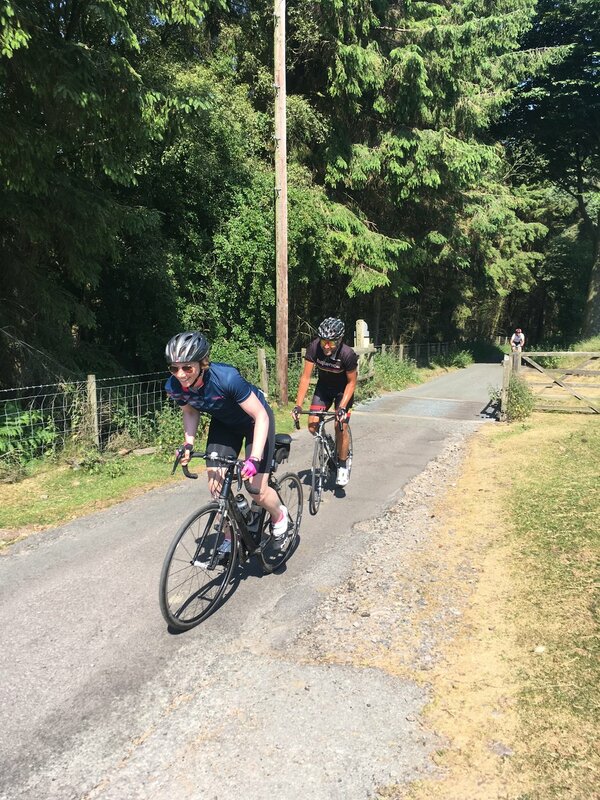 It’s then a short sharp climb and a long winding descent back to Machynlleth before taking on the challenging 8-mile climb you descended that morning. Refuel at the top then it’s a gently undulating route back through the peaceful Hafren Forest, Hafren being the Welsh name for the River Severn, the beginnings of which you’ll ride alongside as it makes its way on the long journey out into the Bristol Channel. Luckily for you, it’s not quite as far with just a short descent left back into Llanidloes. Starting the day in Welshpool, you’ll be out on smaller roads straight away and heading for The Long Mountain (it’s not actually a mountain) and a section of Offa’s Dyke, an ancient fortification that separated King Offa of Mercia’s kingdom from Powys on the Welsh side. A series of steep climbs brings you to the top of Stiperstones for your first feed, a hill with distinctive jagged rocks that once stood proud above the glaciers of the Ice Age. The next climb takes you to the top of the famous Long Mynd, with its 360-degree views and gliders soaring high above you, before descending to the historic market town and hiker’s paradise of Church Stretton. A series of quiet lanes leads you onwards to your charming tea-room lunch stop. A mix of Sustrans routes and quiet roads leads you back north in the afternoon via the mediaeval border fortresses of Bishop’s Castle and Montgomery. We’ll be staying at the start in Llanidloes overnight on the Thursday, Friday and Saturday. We do not provide accommodation for anyone joining us for more than one of the events, so you have the flexibility to choose a location and budget best suited to your requirements. We will however meet for drinks on the Thursday before the events start, and book tables for an evening meal in a local pub on the Friday and Saturday night, so you can join us to socialise with fellow riders if you wish. This is not included in the event price but we’ll let you know the venue, meal options and price nearer the time and you can join us if you’d like. We do not charge a fee for organising this, only the price of the meals. We’re delighted to use these rides to support all of our great charities; Bristol Animal Rescue Centre, Devon in Sight and One25. We will donate £1 from your entry fee for each day you enter to be shared equally between the charities and we’ll send you details about how you can use the challenge to fundraise for one or all of them too if you’d like.